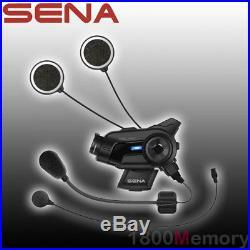 Sena Motorcycle Helmet Camera & Headset Intercom Communication. Created to capture every adventure Equipped with upgraded 2k motorcycle helmet camera specifications, the 10C Pro shoots in crisp QHD (1440p/30fps or 1080p 30/60fps) with a resolution of 3.7 MP (16:9) and an increased 135 degree field of view. The 10C Pro also features Smart Audio Mix, which mixes audio from the intercom and music from your smartphone straight into your video. 4-Way universal intercom capability Stay in touch with up to three other riders via built-in Bluetooth intercom up to 1.6 km (1.0 mile) away. Integrated voice prompts advise riders on the use of their device with instant status updates of their 10C Pro. Preview images and configure settings with Sena smartphone apps Using the Sena Camera App, users will have the ability to preview footage being shot on their 10C Pro QHD motorcycle helmet camera directly on a smartphone through built-in WiFi, and even instantly download files. In addition to the Camera App, linking up your 10C Pro with the Sena Headset App (for Android or iPhone) allows you to configure device settings and access an interactive Quick Start Guide. 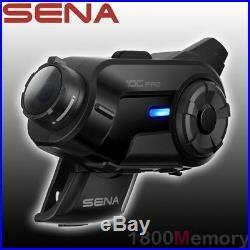 The remote control is supported with the Sena 10C to provide ease of use and controllability of the Bluetooth headset. The handlebar remote has a clamping design for quick and easy installation. With a low energy Bluetooth profile, it has an extensive battery life of three to six months and can be easily charged with a USB. The remote is also compatible with the Sena 10C and 10U. Working distance: up to 1.6 kilometers (1.0 mile) in open terrain, Supports up to 4 riders. Main module: 105 mm x 60 mm x 31 mm (4.1 in x 2.4 in x 1.2 in). Speaker driver unit: 36 mm thickness 6.5 mm. Boom microphone: length 190 mm. Wire between speakers: length 555 mm. Weight: Module 90 g (3.19 oz). Bluetooth 4.1 Profiles: Headset Profile (HSP), Hands-Free Profile (HFP), Advanced Audio Distribution Profile (A2DP), Audio Video Remote Control Profile (AVRCP). Built-in wide band Codec (HFP). Sample rate: max 16 kHz. With RDS AF (Radio Data System Alternate Frequencies). FM radio frequency specifications: 76 - 108 MHz. Optical: Field of view 135 degrees, Aperture f/2.0. Photo: 3.7 MP (16:9). Time-Lapse Mode: Single shot in every 1 or 10 secs. Li-Ion Battery: Charging time: 3.5 hours. External Memory: MicroSD memory cards up to 64 GB. 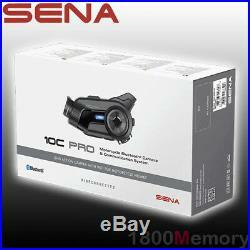 The item "Sena 10C Pro Bluetooth Motorcycle Camera & Helmet Headset Intercom Communication" is in sale since Saturday, April 28, 2012. This item is in the category "Vehicle Parts & Accessories\Motorcycle Parts\Electronics & Navigation\Intercoms".